Hibernian are expecting a welcome fitness boost in the coming days as four players return to training. Head coach Alan Stubbs is hopeful defender Jordon Forster and on-loan Chelsea striker Islam Feruz can prove they are over recent injuries by training this week. And the Easter Road side anticipate that midfielder Fraser Fyvie and summer signing James Keatings will be back with the rest of the squad next week. Forster has been sidelined since the season-opening 6-2 hammering from Rangers in the Petrofac Training Cup because of a hamstring injury, whilst Feruz has missed the last two games because of a knock picked up in training. Fyvie, meanwhile, has been sidelined for five weeks with a hamstring problem and Keatings has been forced to sit out the last three games with a similar injury. Stubbs said: “We’ll have a couple back this week. “Jordon will train this week and Izzy will train this week and the following week there’s every chance you’ll see James Keatings and Fraser Fyvie back as well. 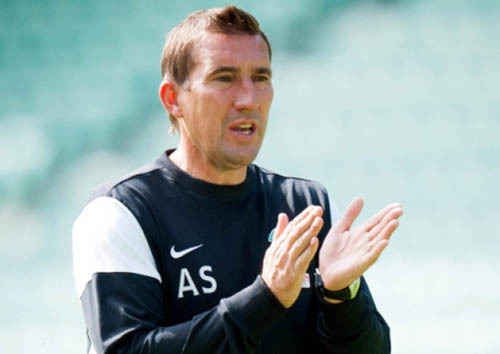 The return of the quartet will strengthen Hibs’ squad and provide Stubbs with greater options as he tries to keep pace with Rangers in the Championship race. The frustrated Easter Road side slipped further behind the runaway league leaders when they could only draw 1-1 with St Mirren at the weekend. Stubbs bemoaned a lack of ‘zip’ in their play as they suffered a hangover from their League Cup exploits in midweek, when they became the first team to inflict a domestic defeat on Aberdeen. The former Celtic and Everton defender knows they cannot afford too many off days if they are to put up a challenge for the automatic promotion spot and is hopeful his players will be back to their best for Saturday’s away trip to Queen of the South. He added: “It’s a difficult place to go to, as they all are, to be honest. There’s no away fixtures that are easy. “We’ll rest up, we’ll recharge the batteries with the players and give them time to recover.